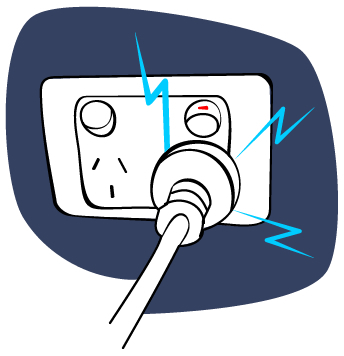 Arcing or sparking plugs may result from unplugging appliances before turning them off. Anything that arcs or emits a hot smell should be investigated. Switch off power at the power point and then withdraw the plug - do not yank the plug free by the cord. Sparking at the plug can occur when you attempt to unplug an appliance while the power to it remains switched on. This can be normal - it’s an ‘inductive kickback’ which you might see with a vacuum cleaner or other appliance with a motor. You should not unplug an appliance without either switching off at the power point or – if fitted - the main switch on the appliance. Assuming that you are convinced that an appliance is safe - and that you have noticed sparking at he plug - you should call a licensed electrical contractor and have the plug replaced. A word of caution is in order: even though you can buy replacement plugs for a few dollars down at the local hardware store, it's actually illegal to rewire your own plugs in Australia unless you're qualified to do so. It may sound like an easy job, but unless a plug is wired by someone who's specifically qualified to do so, not only are you breaking the law, but you're also likely to forfeit your home insurance, which could be an extremely costly mistake!